4. 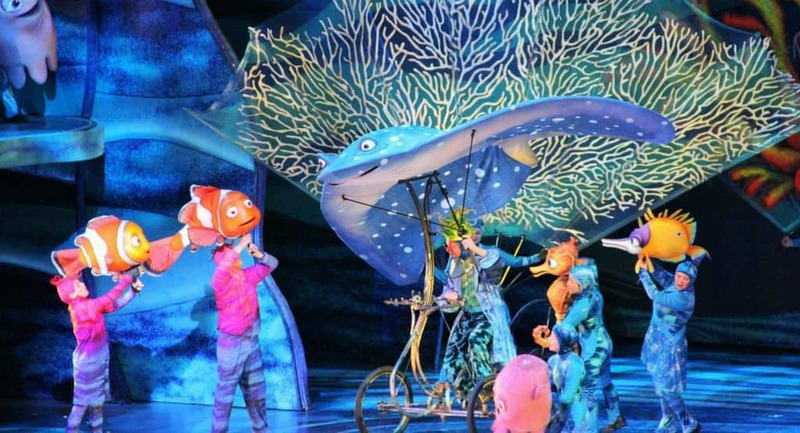 Finding Nemo – The Musical – Another live show in Disney’s Animal Kingdom brings a classic Pixar film to life through huge puppets and live acting. Finding Nemo – The Musical is performed several times each day in the Theater in the Wild in the Dinoland section of the park. The show is entirely housed indoors, making it a great rainy day option and the theater can hold a massive amount of guests. Finding Nemo – The Musical tells the epic adventure of Marlin and Dory through actors who control larger than life puppets of the characters. Favorite moments are brought to life in addition to musical numbers that guests absolutely love to sing and clap along to. No day, especially a rainy one, in Disney’s Animal Kingdom is complete without enjoying a showing of Finding Nemo – The Musical!